I feel like it has been an eternity since I have posted a review (actually it has, my last post was in January). As some of you know, I've been working on a thesis and a jam-packed semester, so that is the reason I have been away. I have good news though: I passed my thesis, I am graduating with a Bachelors in psychology, and the best news is that I can focus on this blog again!! I have had quite a few things I've wanted to blog about, so expect weekly releases for a while. First on my review list is the new Baron Fig Squire Click pen. Full disclosure: I received a pen free of charge from Baron Fig, but it in no way influenced my review or opinion of the pen. Okay. So as a "mostly pencil user" pens aren't really my thing. When I write in my journal I use a pen and have been using the Baron Fig "Key" Squire (which is now sold out). I love that pen and am surprised that I do since it is so damn heavy (it's brass). On the entire opposite side of the spectrum re: weight, is the Squire Click. At a mere .7 ounces, the Squire Click feels great in hand and lessens the fatigue I usually feel with heavier pens. I also like the brushed aluminum finish of the pen-- it offers the right amount of grip, without being intrusive. Baron Fig touts four main "features" of the Squire click: it has a click top, it's ultra minimal, it has a versatile size, and it's made to last. I am going to address these four selling points and base my overall review on this framework. Click Top: sure, the Squire Click has a click top that Baron Fig states is an "easy to use click top with a smooth motion and satisfying feel." I agree on the "easy to use" part, but to me it does not feel smooth or satisfying. First, the pen does not offer a satisfying "click" when engaging the mechanism. On top of that, it makes this scrape-like sound when pushing down the click mechanism. There is nothing wrong with the quality of the pen in this regard, but subjectively speaking, I don't like the feel of how this pen clicks. Most of us buy pens for their function and performance on paper, so this is not a deal-breaker for me. And hey, maybe my idea of satisfaction is different than yours, so there's that. Ultra Minimal: Baron Fig nailed in on this point. Unlike other pens where there is a lot "going on" the Squire Click gets out of its own way and is sleek and simple. I would have liked to see a very small, minimalist clip, but I can always add one on myself via Tofty Design. Versatile Size: again, kudos to Baron Fig on this one. Many, many times when I am using a pen it is either too long or too short for my liking. This is the Goldilocks of the pens I have-- it's just right. Also, the diameter of the pen is great for my small hands. It's sort of pencil-sized and I feel like I have better control while writing with the Squire Click. Made to Last: I can't really comment on this yet since I have only had the pen for about a month. If it is in line with other Baron Fig products, I don't suspect that this statement is false. Their regular Squires have held up beautifully and have resisted many drops and other rough treatment. Overall, if you are a pen user, the Squire Click is a purchase. The major selling point for me was the design. Its barrel is perfect for my smaller hands and the smooth, yet not too slippery feel of the barrel works well. The fig wine color I have is beautiful and goes well with my other Baron Fig products. 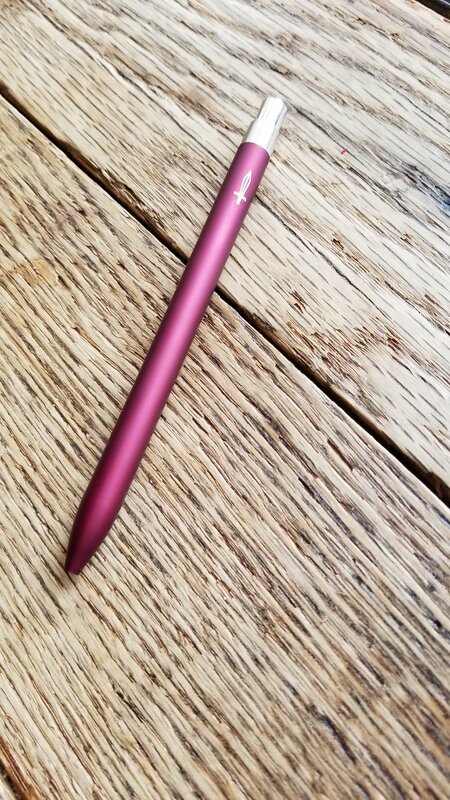 To make this the perfect pen, I'd recommend getting a plastic clip from Tofty Design as metal would probably scrape the barrel. Thanks to the crew over at Baron Fig for providing a Squire Click for review. Again, free stuff does not influence my review whatsoever. I was in love with the beauty of this brass pen, but was unsure of how I would feel about its weight. Upon weighing the Key Squire and a regular Squire, the Key weighed just over two times the weight of the regular. What's equally exciting about the brass Squire is the amazing patina that it will develop. The brass pen also pairs amazingly with the dark green Confidant and the pen's performance on the paper is great as always. 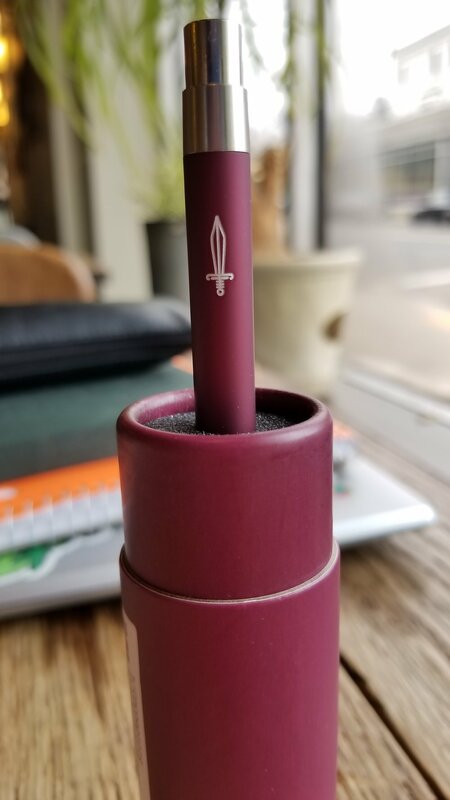 The Lock Confidant is perhaps one of my favorite Baron Fig offerings to date. I really love the embossed maze and key on the front of it-- it really makes me think I am locking away all of my thoughts and dreams into this book. Speaking of which, I have started to use this Confidant as a journal and have been thoroughly enjoying the theme. The inside front cover is a bright white with a maze design. Interspersed are various symbols that need decoding. The paper inside is dot grid and is consistent with the paper in all of the other Confidants-- slightly toothy and perfect for the Squire. The only thing I don't like is the slight amount of ghosting that happens when writing on the page. Not sure if that will ever be fixed, but it's not a deal-breaker for me. I just wish their own pen wasn't doing the ghosting. Overall, I think if you were ever on the fence about picking up a limited edition pairing, this is the one the pull the trigger on. The theme is there, the quality is there, and the brass Squire makes it so worth it. Head over to Baron Fig soon because I feel as though these will sell out quickly.